AEP President and CEO Nick Akins (center) welcomes Essence and Xavier McCrary (center, front) to their new Habitat for Humanity home. Also shown are (back row, left to right): AEP employee and retiree volunteers Dale Krummen, Larry Hutchinson, Scott Moore, Jim Rosing, Patrick Andrasko, Bill Turns, Brad Martin, Mike Martin, Ernie Pfund and Kirk Nofzinger. 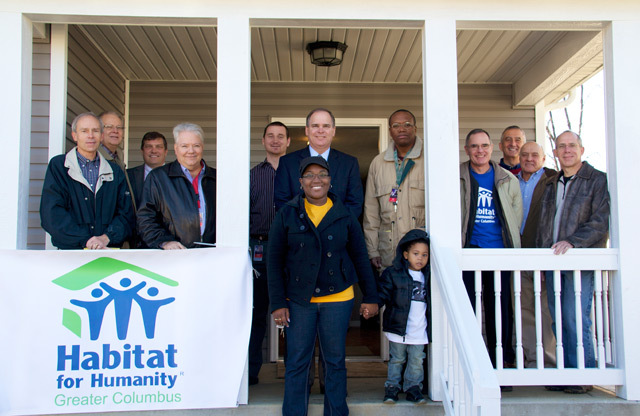 COLUMBUS — It may have been the first week in January, but the newest Habitat for Humanity – Greater Columbus (HFHGC) home, built by a team led by AEP employees and retirees and funded by the AEP Foundation, surely looked like green pastures to the family of Essence McCrary and her son Xavier. The McCrarys received the keys to the story-and-a-half, Cape Cod-style house on E. Gates Street on Columbus’ southside in a dedication ceremony Jan. 6 attended by a number of AEP officials, including Nick Akins, president and chief executive officer. The home is the “greenest,” most energy-efficient Habitat for Humanity home ever built in central Ohio. Jim Rosing, senior architect, was co-house lead with Dale Krummen, retired AEP electrical engineer. AEP is also represented on the board of directors of the Greater Columbus chapter of Habitat, with Scott Moore, vice president – Transmission Engineering and Project Services, serving on the board. Rosing said 40 volunteers helped in the “blitz build” that first weekend to construct the structure’s 36 walls, which were ready for shipping to the construction site in less than four hours. An average of 15 to 20 employee or family member volunteers worked each Saturday, along with an average of six retirees working each Wednesday. The three-bedroom, two-bath, 1,400-square foot home, funded by the AEP Foundation, has a full basement and garage. The AEP Foundation funding includes a special “green grant” which provided for added energy efficiency features to reduce the family’s monthly utility costs. Beginning in 2010, the AEP Foundation has partnered with HFHGC to underwrite energy efficient elements in five homes each year, including Energy Star-rated appliances, energy efficient light fixtures, water-saving fixtures, ceiling fans, enhanced insulation and non-toxic sealants and floorings for better indoor air quality. “That may be the best part – that this home will provide the family with lasting comfort and efficiency throughout the seasons, as well as lower water, gas and electricity bills, due to the green enhancements built in,” Krummen said. AEP also partnered with SHOP Grant and the City of Columbus Neighborhood Stabilization Program. Numerous contributors provided materials and services to the project. Habitat for Humanity – Greater Columbus works throughout Franklin County, Ohio, and has built 239 homes and counting since 1987. Habitat affiliates work locally in communities around the world to select and support homeowners, organize volunteers, and coordinate house building. Since its founding in 1976, Habitat has built more than 300,000 homes worldwide, providing shelter for more than 1 million people in 90 countries.